Summer Camp at USA Youth Fitness is the place to be THIS break! 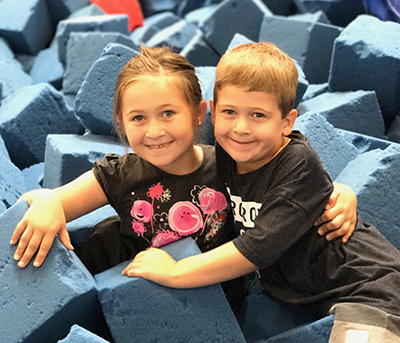 Give your kids something fun to do during the summer months while keeping them active, right here in Gilbert, AZ! Don’t miss out on the fun! Our Adventure Day Camps feature nonstop activities ranging from open gym playtime & obstacle courses to water day activities and field trips! We offer morning only and full day camps to fit YOUR schedule as well as full week or single day options! Camps are geared for ages 5-12 yrs. Sports skills: gymnastics, basketball, dance & soccer! Field trips to places like Makutus Island, BounceU, Stratum Laser Tag, Phoenix Science Center & more! Water Days include fun play outside with water guns and water balloons! Parent Shows – every Friday we host a Parent Show for your kids to show off all the cool moves they’ve been learning all week! -Full Day Campers need to bring their lunch or purchase a healthy boxed lunch from USA Café for $4.50 + tax. Boxed lunches include: PB&J, Turkey & Cheese sandwich, or small Ham or Turkey Lunchable + fruit, juice, string cheese & treat. -There is a $50 non-refundable deposit per child, which holds a spot for the child. The balance is due the Monday of camp week (final payments will be taken from the account on file, if not paid Monday morning). There will be NO REFUNDS of camp tuition, beginning Monday of camp week. Don’t forget to ask about our Sibling Discount on Weekly Rates! I love all the different activities that are offered; it gives them the opportunity to feel like the gym isn't only work and class but also fun, and I prefer that my kids are having fun at the gym than sitting in front of the TV! I love that my kids can go here and burn energy while learning to be healthy.